The World Cities World Class University (WC2) network brings together eleven universities in major global cities to discuss the challenges facing urban areas in the 21st Century. 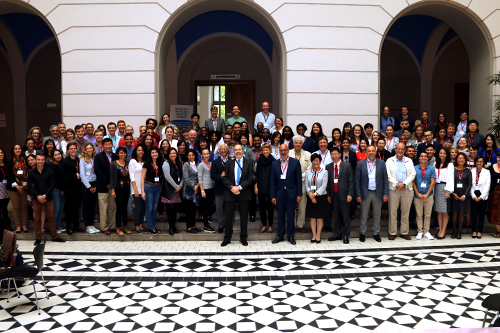 The second WC2 Symposium took place in Berlin, Germany during August, hosted by Technische Universität Berlin. The event brought together 140 participants (70 students and 70 staff) for a week long Symposium designed to address health, business, cultural and environmental issues. Leading academics gave keynote speeches to open the event. Students then split up into separate groups to discuss five theme areas; Business, Eco-campus; Global Cultures; Global Health; and Transport. Not only did the Symposium provide over 70 students with a high quality international education experience, it provided a platform for staff from WC2 institutions to discuss the further development of the network and to identify areas of potential collaboration between their respective institutions. Isaac is a postgraduate Health Policy student at City. Following the Symposium, Isaac said the chance to meet students from across the world was unmissable. Here, Isaac shares what he learnt during the week. I got involved with WC2 for the international experience and to meet like-minded students and academics. For me, the chance to work with students from different parts of the world, share research ideas and find out what’s going on in different cities was an opportunity not to be missed. Climate change, Sustainable Development Goals and the role of universities in cities, were some of the topics we discussed during the Symposium. We also talked about what countries and cities can do to tackle the issue of climate change. Before the Symposium, myself and a group of other City students collected census data in London and piloted a Quality of Life questionnaire on those aged 65 years and over. During the Symposium we then compared this data with other cities. I learnt a lot about life in other countries and what London can do to improve the quality of life of its citizens. Learning how to design a questionnaire and work on my presentation skills will also be really beneficial to my future career. I would definitely recommend it to other students. It was great to be part of a pool of scholars from all over the world, sharing ideas and having discussions on topics of mutual interest. Julia is a PhD student at City and her research focuses on the employment rights and human rights of seafarers. Julia described the Symposium as “mind-broadening”. Here she talks about the benefits of taking part in WC2, and why she’d recommend it to other students. I got involved with WC2 because I think it’s a great project. I’m about to finish my PhD and I thought WC2 would be an excellent opportunity to share ideas with different researchers and broaden my research field. As part of WC2, we were divided into groups and given specific topics to discuss. I was part of the Transport group, and we talked about ways to improve the transport facilities of the University’s campus. During the week, we visited Berlin’s urbanisation centres to see the developments going on in the City, and challenges and plans for the future. I shared my own experience with the group and gave a presentation on the urbanisation of Rio de Janeiro, the city I’m originally from. There were many highlights of the Symposium. Firstly, it definitely broadened my mind in terms of sustainable development. It was extremely rewarding to see what people from different fields and backgrounds were researching. It was also amazing to see the research conducted by different institutions, located in different countries and to get a better understanding of the unique challenges each city faces. Finally, WC2 is an excellent network platform. I would definitely recommend this network to other students. Not only that, I’d love the opportunity to go again. It enhances your knowledge and allows you to see how different fields can be interrelated. Students were supported to attend by a Santander Mobility Scholarship. The next Symposium will take place in Sao Paulo in August 2017, contact Mark Hertlein, Head of International Relations for more details. The World Cities, World Class Universities network (WC2) has been developed to bring together universities located in world cities to address cultural, environmental & political issues.